Should I sell STOCKS and buy GOLD? Well, something like that! The US Stock Market has been experiencing a wild correction in the recent months. Those who managed to see this sideways pattern and enjoy higher risk could have certainly enjoyed the fruitful profits from the swings depicted in a below orange channel. 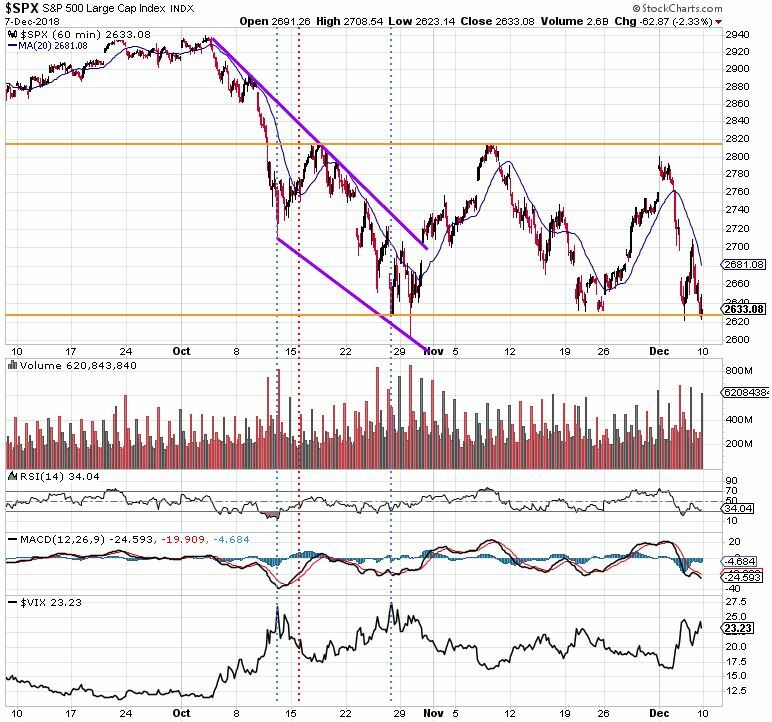 Last time we have analyzed this chart, the goal was to show you that predicting a bottom is a myth and you are going to see this once it happened. It has not yet happened and thus, we are not going to talk about it again. We are going to talk about potential bear market ahead. The S&P500 as well as the other indexes is sitting at its technical support level. The actual S&P support is a range of 2580 and 2630. Whether this is going to be broken this year or the next one is not really important. It is obvious where the levels are and thus, you can take advantage of that. Important is that we are experiencing a third stage of the market cycle. The economies are booming, earnings are OK and thus, the biggest threat to a bull market is an undisciplined inflation. If the inflation was rising modestly and as expected, even the bull market could still go, however, it is not certain that FED can really managed this. The US-China trade war and strikes in France are not helping really to preserve the bull market. Today, Germany, the biggest economy of Europe, was hit by huge train strike. The year 2019 is going to be interesting and certainly volatile. When the stocks stop being that interesting for investors within a market cycle as we know it, the commodities become more favorable to invest in. Especially GOLD and SILVER because they are precious metals and serve as a powerful hedging instrument against the unfriendly stock market. Gold was in a bear market for some time and in very a long-term we can see how it went through various phases and levels. 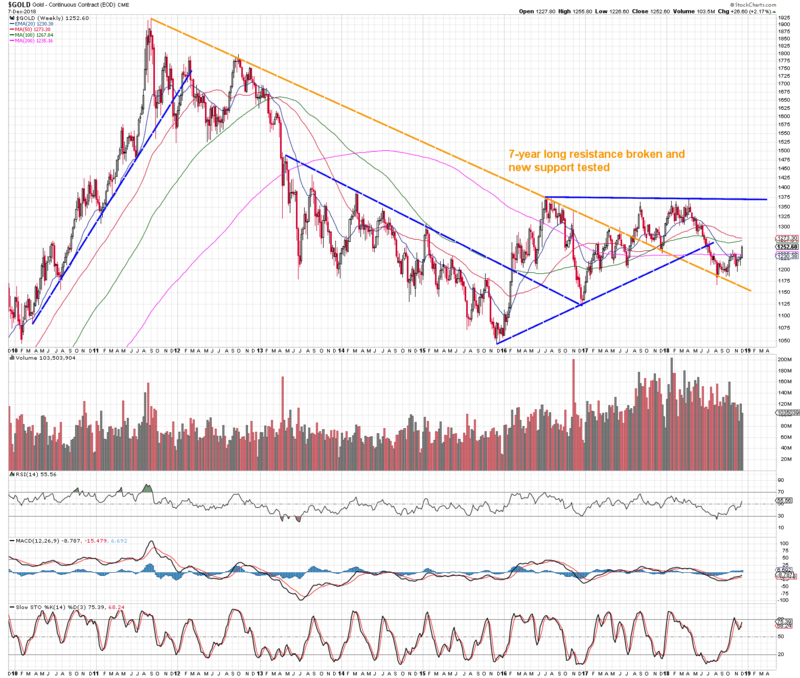 Below you can see a model that shows trend lines around which the price of gold was moving. If you click on a chart you’ll seethe very long time scale. The gold has managed to break the 7 years old resistance and recently test it in summer 2018. At the moment it perhaps looks like it actually bottomed. 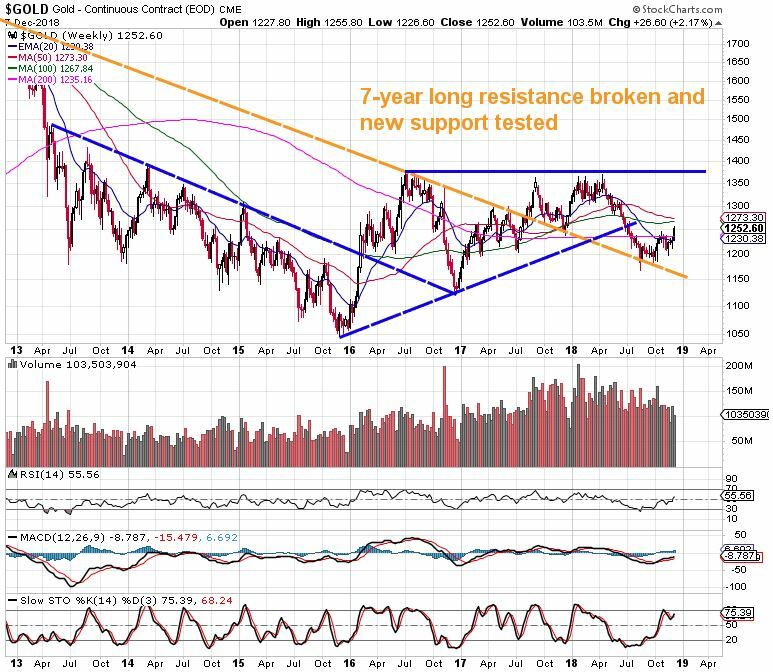 Since August the price of gold started to trend higher and most recently – last week it has broken the 200 moving average, which is a strong signal for this commodity to enter its bull market. The experienced investors are re-balancing their portfolios at the moment. The growth stocks are not going to grow in such a pace as we were used to. In contrast, many of them will be eliminated. The good quality stocks will value will manage and thus, the investors need to focus on such companies. The gold and silver are likely going to experience a bull market and thus, mining stocks will probably boom in their values. 2019 will belong to rational traders and savvy investors! PreviousPrevious post:Stock Market Ahead of Crucial Support Level TestNextNext post:Are Pot Stocks Still In Consolidation?